All right, I'm going to start off by admitting that this is the first book I've read by Joe Abercrombie, despite the many recommendations by my buddy Ian. Let me just say that for how much everyone seems to talk about how violent and bloody his books are, I was pleasantly surprised to find that this was an intelligent and well-written contemplation on the nature and innate hypocrisy of warfare, and indeed, of humanity itself. I also enjoyed how the third-person narrative used the lexicon of the character who was being followed to more fully immerse the reader into that character's mindset. I'd seen this sort of thing done before, but never well. The fight scenes! Dirty and relentless, full of missed shots, slip-ups, friendly fire and grappling, this is what real fighting is like. Anyone who's done any martial arts, weapons training, or even just been in a few brawls knows that combat is more often messy than not, and Abercrombie captures that perfectly. I was also impressed that this book essentially covers one battle and that battle's immediate fallout, and I'm not sure I've ever read a book that's done that before. 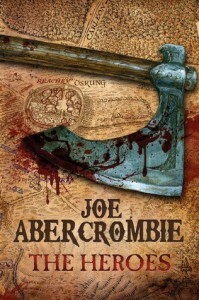 All in all, a fantastic book and a great introduction to Abercrombie's world for me. I didn't at any point feel like I was missing anything from not having read the preceding novels in the chronology, so I think this book works well as a stand alone in a larger series. I'll definitely be looking to read the First Law trilogy now, though.